Wildflower season—a "fire of spring" that sweeps over the hills in a blaze not of flames but of living color—arrived in late winter this year, bursting with spectacular but ephemeral bloom. 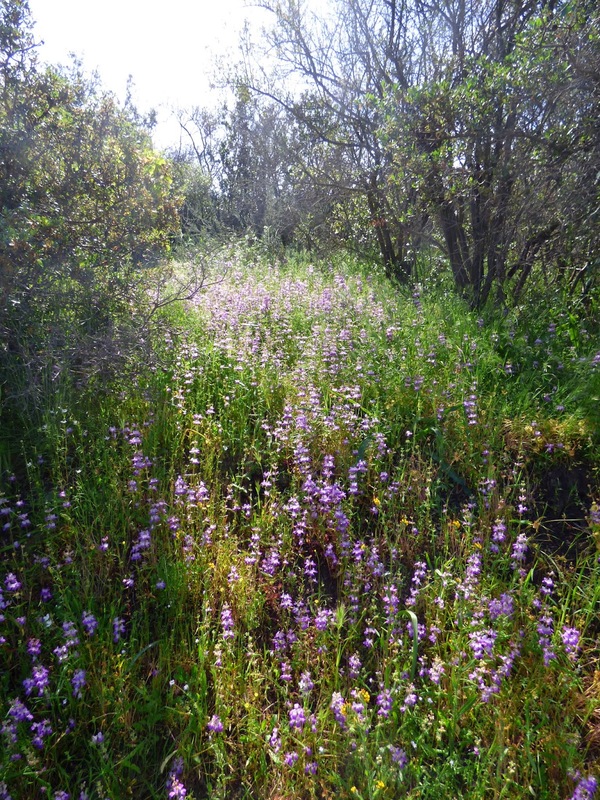 Easter was early this year, too, arriving at the apex of the wildflower display in the Santa Monica Mountains. The weather experts warn that we are still many inches of rain below normal, but here in Malibu we received twice as much precipitation as last year, and it was enough to generate a spectacular crop of wildflowers, including an abundance of some seldom seen beauties. The winter green and lush flowers are already being transformed by the alchemy of hot weather and Santa Ana winds into summer gold, despite one last April shower, but it's not too late to look for wildflowers. 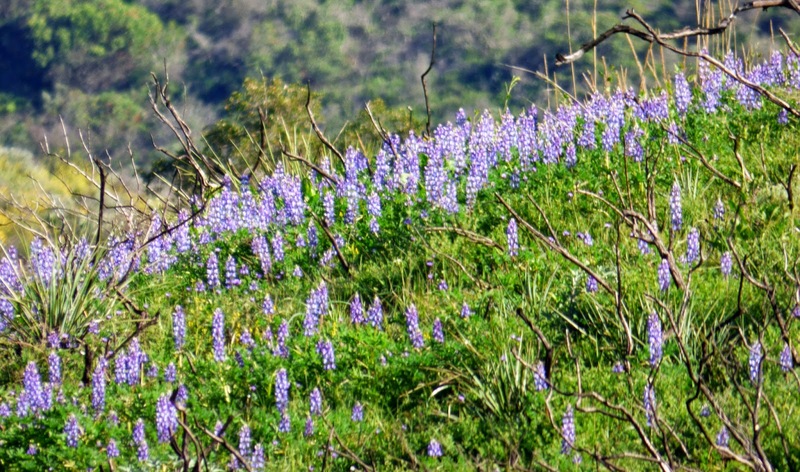 Lupin covers a hillside burned in the 2013 Springs Fire, in just one of the many spectacular displays of local wildflowers this spring. Many fire followers bloomed early and have already vanished, but many wildflowers are still blooming in the burn zone, including vivid purple and blue phacelia species. 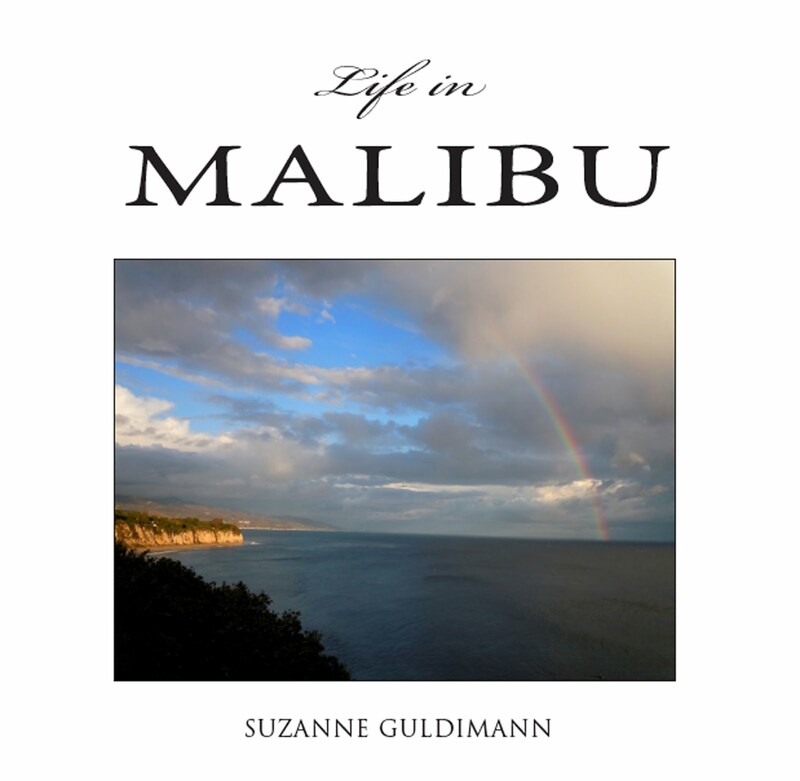 I wrote a 2015 guide to spring flowers for the March 13 issue of the Malibu Surfside News, but the unfolding tapestry of spring keeps revealing new and marvelous things, and one doesn't have to go far to find remarkable sights. In the time that it took me to put this post together, the giant coreopsis flowers at the Point Dume Headlands have given way entirely to bush sunflowers, but there are still plenty of Malibu wildflowers to see, as the season continues to unfold. 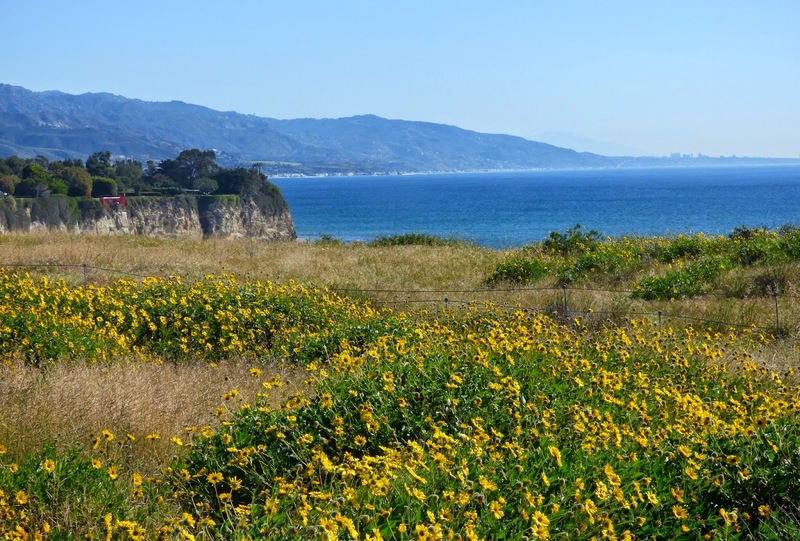 Golden stars are currently at peak bloom at Malibu Bluffs Park Open Space. 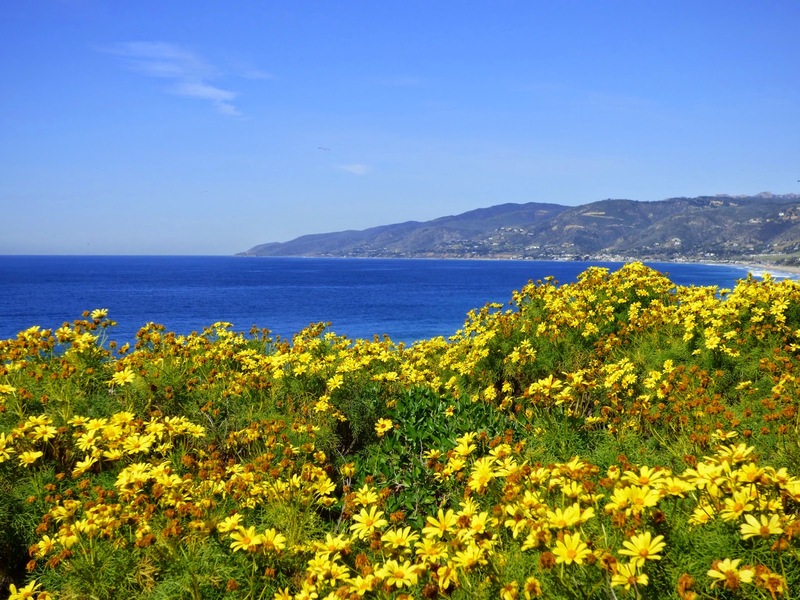 The giant coreopsis is almost entirely gone to seed at Point Dume Nature Preserve, but bush sunflower is in full bloom, and morning glories, sand verbena and evening primroses are still blooming. At Charmlee Wilderness Park, the meadow is full of orange and yellow deerweed and purple sage, and all through the mountains there are pockets of owl clover, goldfields, poppies, blue larkspur and the pagoda-shaped pale pink flowers called Chinese houses. 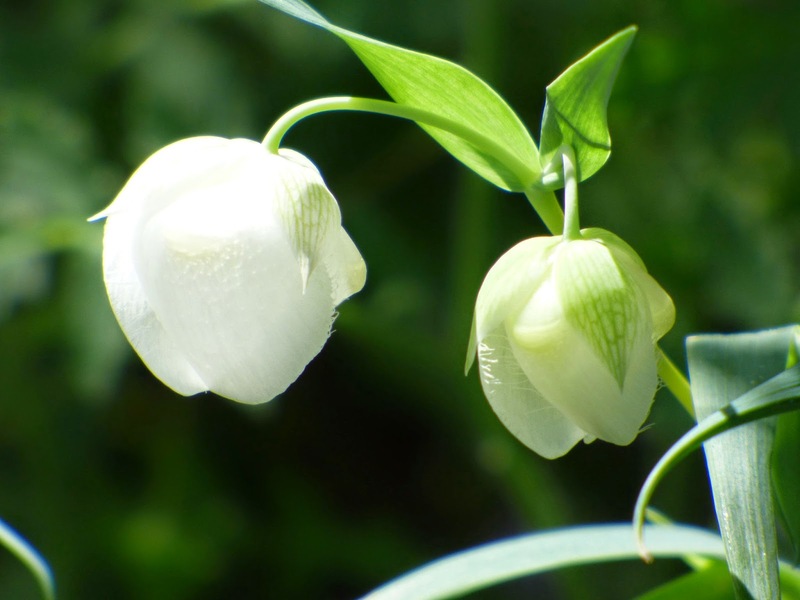 If you know where to look, you may still be treated to the spectral white beauty of globe lilies, or the exotic magenta flowers of Indian warrior. Many spring wildflowers are truly ephemeral—blooming for just a few days before vanishing completely, but while flowers like padre's shooting stars and chocolate lilies bloomed and vanished before spring officially arrived, the season for flowers like clarkia, penstemon, and the towering spires of orange Humboldt lilies is just beginning. Here's a look at some of this year's spring treasures. A river of flowers cascades down a hillside along Mulholland Highway. That river is comprised of white California popcorn flower—a member of the borage family, California poppies and masses of owl clover. Here's a closer look at the tiny owl faces that give owl clover its name. Owl clover isn't really a clover at all, it's a castilleja, a member of the same family as Indian paintbrush, and like the paintbrush it's partially parasitic, using the roots of grasses and other flowers as a source of nutrients. Owl clover only flourishes in a year when there are plenty of host plants, but when conditions are right, this little purple flower can be spectacular, carpeting whole hillsides. 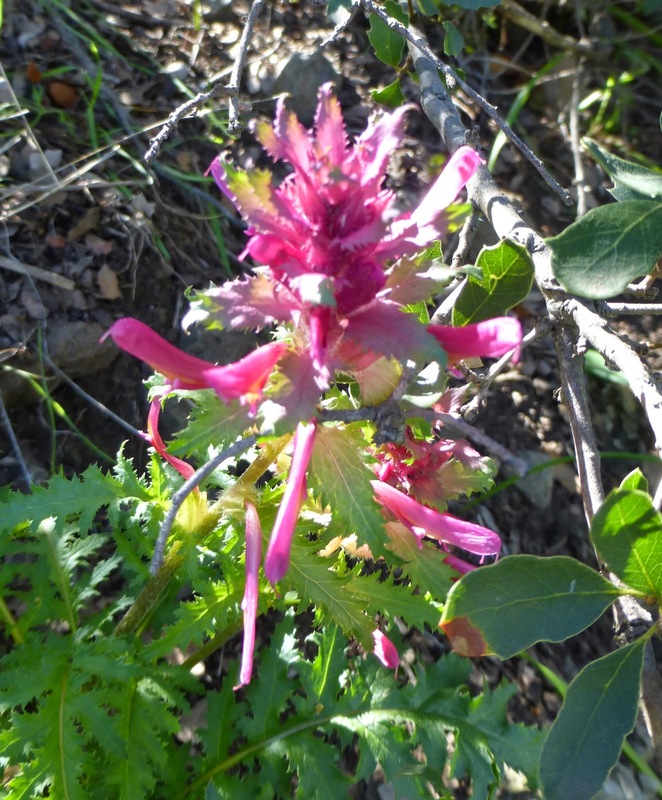 Indian paintbrush is the more familiar species of castilleja in the Santa Monica Mountains, but this year there seems to be a lot of Indian warrior, Pedicularis densiflora, as well. 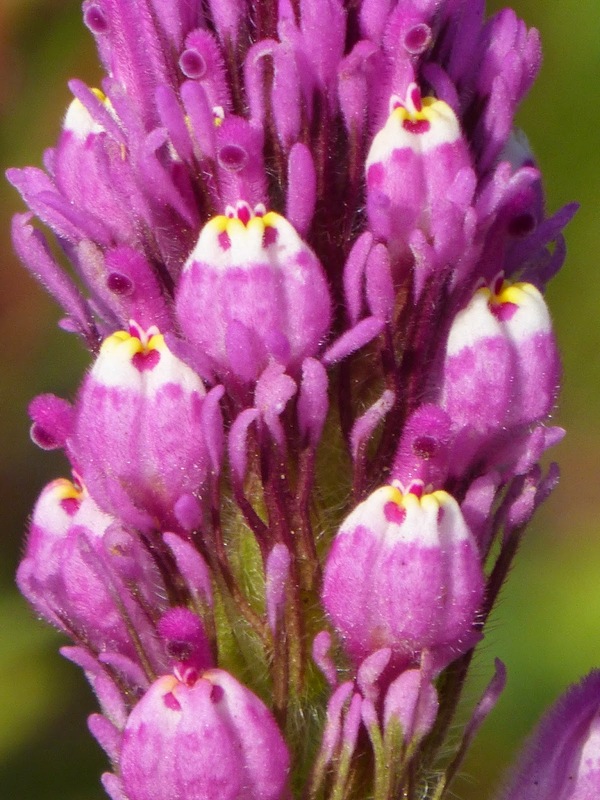 Both species are hemi-parasitic, just like like the owl clover, and depend on host plant for nutrients. Indian Warrior reportedly prefers manzanita or chamise, but this one was growing under a clump of scrub oak. Owl clover, California goldfields and wild hyacinth dazzle the eye along Pentachaeta Trail, in Trifuno Creek Park, just over the mountain from Malibu in Westlake Village. 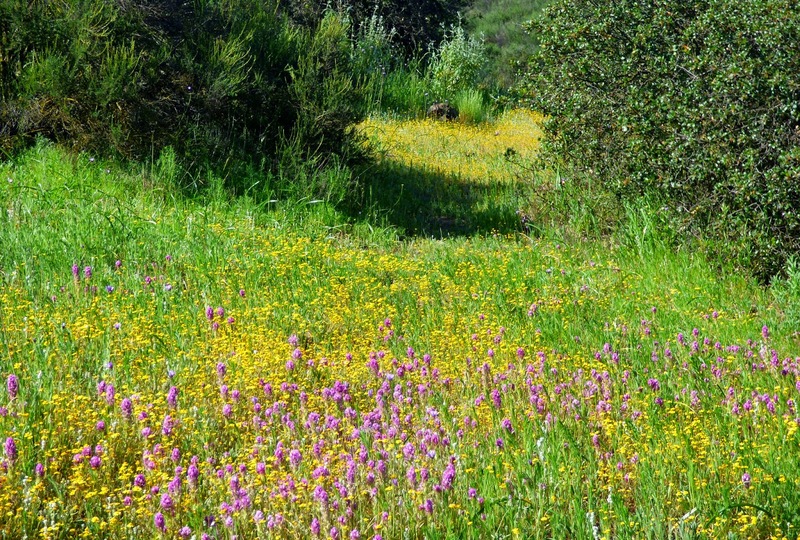 This trail, on the north side of the mountain, is arguably one of the best wildflower walks in the Santa Monica Mountains. This area is in full bloom right now, while most of the wildflowers on the more exposed south side of the mountain already finished blooming last month. In a good year, California goldfields, Lasthenia californica, transforms whole hillsides into cloth of gold. In additional to field flowers like owl clover and poppies, there's been an extraordinary crop of flowers that grow from native bulbs and corms this year. This beautiful wild brodiaea has been especially abundant. It's common name is, regrettably, blue dicks, from the Latin Dichelostemma. It's also called "purplehead," which isn't much better. I like the other common name, wild hyacinth, although this flower isn't related to the true hyacinth. In fact, the brodiaea genus belongs to the asparagus family. The corms and the flowers of this species are edible. The Chumash developed a variety of techniques for encouraging this plant to grow, and it was an important food source and trade item. It must also be a tasty source of nectar—it always attracts large numbers of butterflies, including this painted lady butterfly—Vanessa cardui. Here's another beautiful native brodiaea. This one belongs to the genus triteleia and is graced with nicer names than its blue cousin: golden star and prettyface. 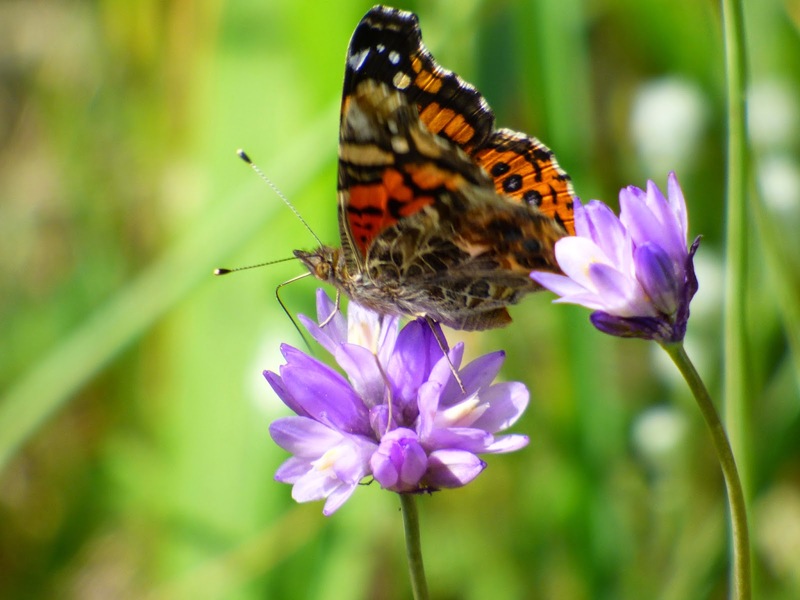 At Malibu Bluffs Park Open Space, golden star usually blooms together with the Catalina mariposa, but this year, the mariposas were the first to bloom. This was the first golden star I found at Bluffs Park this spring, blooming alone among the mariposas. By Easter, when the mariposas were almost finished, an entire constellation of golden stars was flowering at the the park. 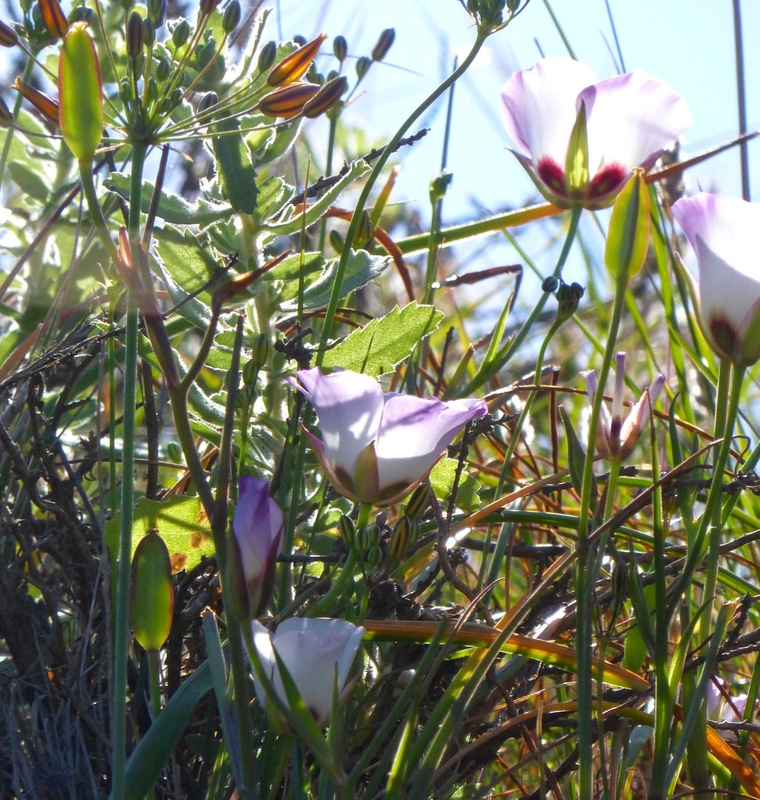 Rare Catalina Mariposa lilies, Calochortus Catalinae, bloomed in abundance at Malibu Bluffs Park Open Space this year. 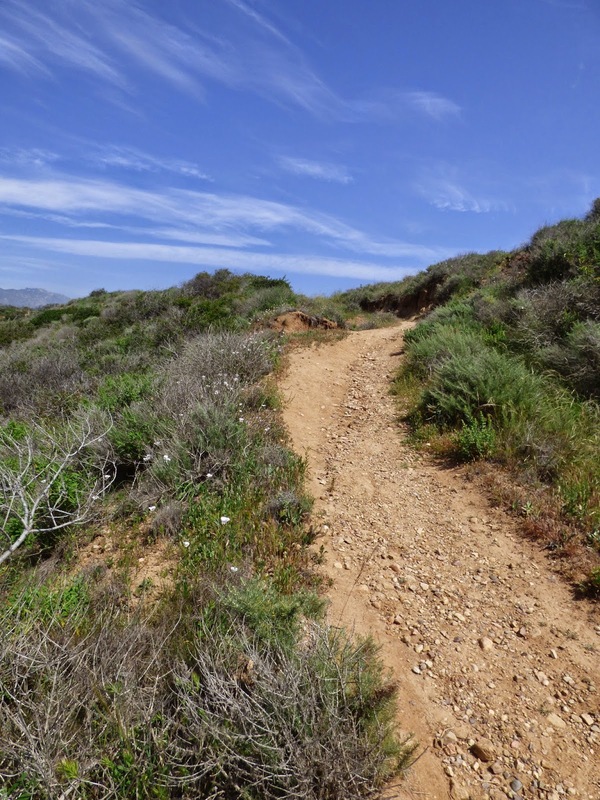 Although the main flowering is over at Bluffs, there are still patches like these flowers lining this steep trail that leads to a Malibu Road public beach easement. Catalina mariposa lilies and golden stars bloom together at Bluffs Park. This mariposa was growing right beside Pacific Coast Highway. Unfortunately, unlike the plants at Bluffs Park Open Space, this colony isn't located on parkland. Instead it's on the site of a future housing development. Rapid habitat loss is the reason this strikingly beautiful wildflower is on the California list of species of special concern. The white globe lily, Calochortus albus, is a close relative of the Catalina mariposa, but this species has managed to avoid landing on the special concern list, possibly because you won't find this beauty blooming on ocean view coastal bluffs. It's a shade dweller, usually found only in the more remote canyons, where is grows under the protective shelter of larger shrubs. Globe lily is a small flower, but it is almost luminous. Appropriately, it's other common name is fairy lantern. 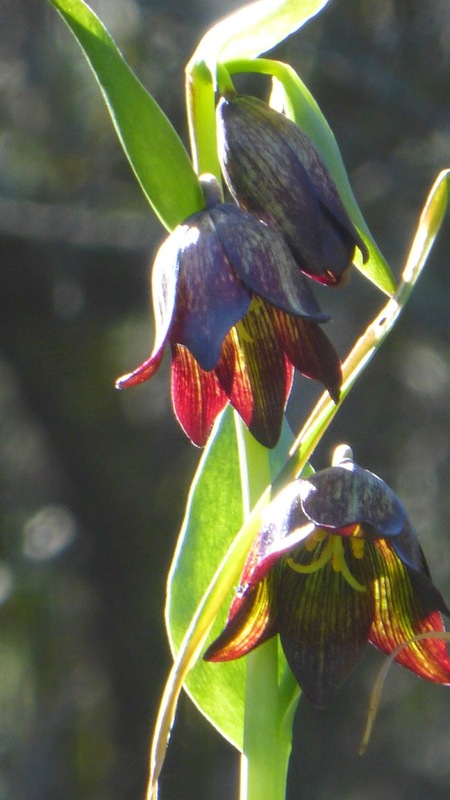 You may find globe lilies growing near Collinsia heterophylla. Like the globe lily, this wildflower thrives in the shade of the scrub oaks, where it can transform a shady glade into a fairytale illustration. Collinsia's pagoda-like flowers give it its common name: Chinese houses. 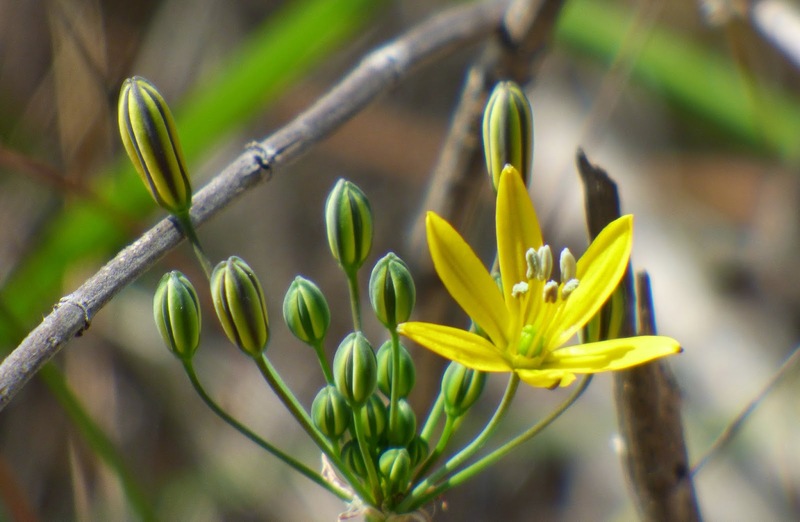 Secluded canyons are also the favored habitat of the chocolate lily, but this is one flower that bloomed early this year and has already completely vanished until next rainy season. 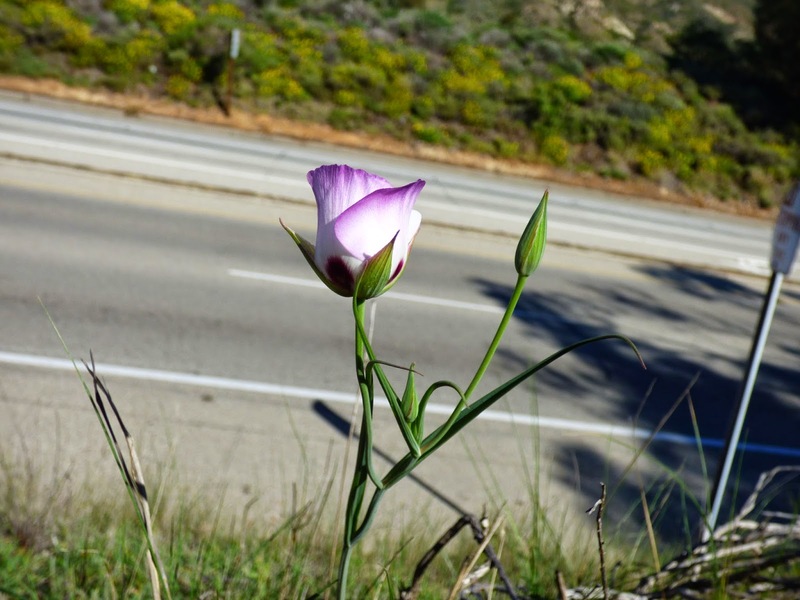 The rarest flower seen on The Malibu Post's spring wildflower ramblings so far this year? This inconspicuous yellow daisy, Pentachaeta lyonii. It may not look like much, but this tiny plant is a federally listed species, and its presence helped save 600-acre Triunfo Canyon Park from being bulldozed for a housing development. Among the most beautiful sights this spring is the host of brilliantly colored butterflies attracted to the wildflowers. This is a red admiral, pausing for a half a second to sip nectar from a wild hyacinth. 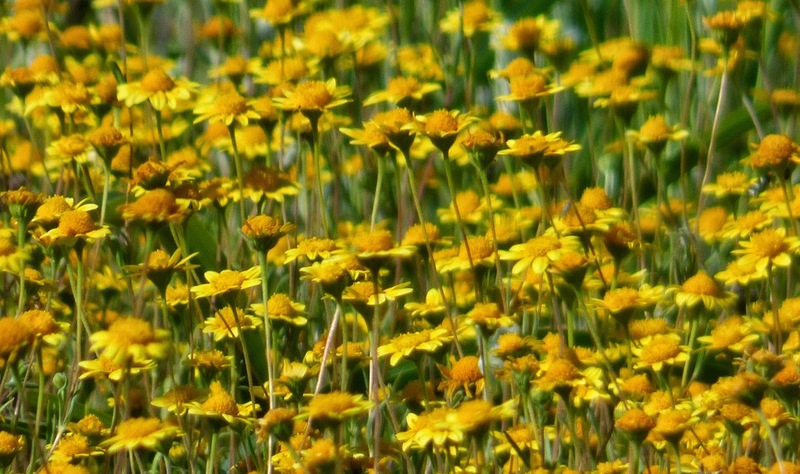 The National Park Service's Santa Monica Mountains What's Blooming website offers updates (somewhat sporadic, because its author recently moved out of state, but still helpful) on where to find wildflowers. 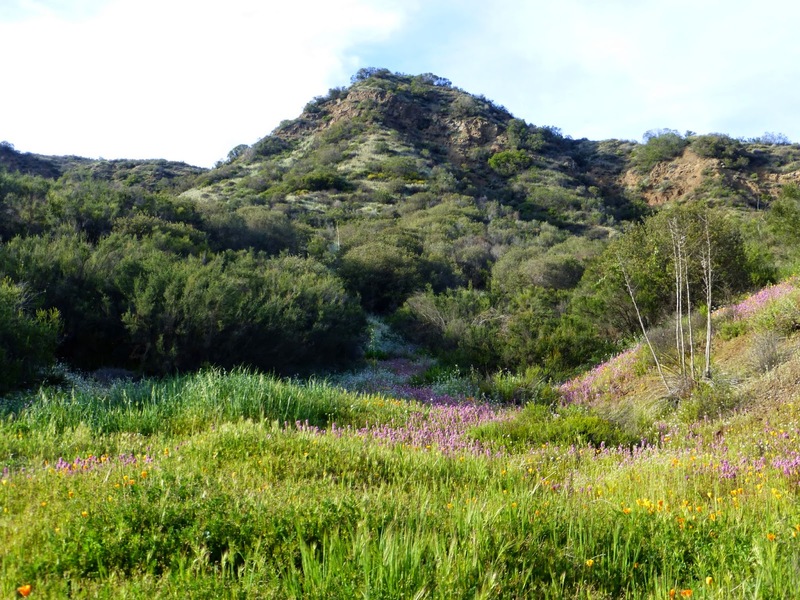 It also provides links to the Santa Monica Mountains National Recreation Area calendar of events, and the excellent SMMNRA wildflower guide and app. 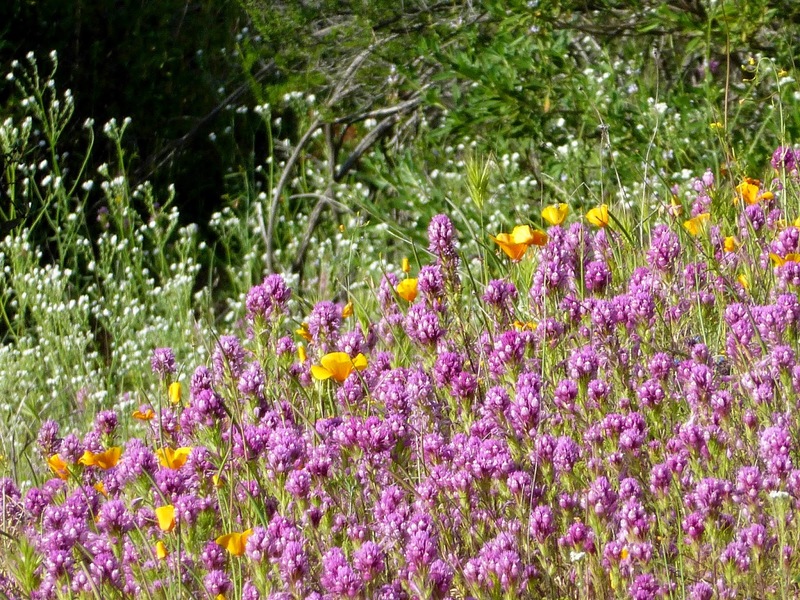 Desert USA's Southern California wildflower report page often includes the local area, in addition to a wide range of stellar wildflower locations, including the Antelope Valley and other parts of the Mojave. Spring doesn't linger for long in Malibu. 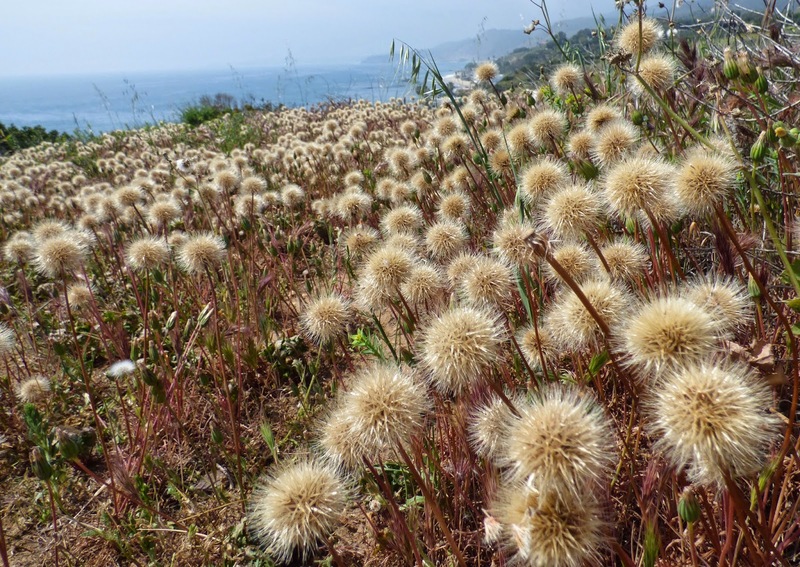 The winter crop of silver puffs, Stebbinoseris heterocarpa, at Bluffs Park has already transformed from pale flowers to luminous spheres of seed, ready for the wind to disperse.